NASCAR is a passion-driven sport. Passsion from the competitors, from the team personnel, and especially from the fans. 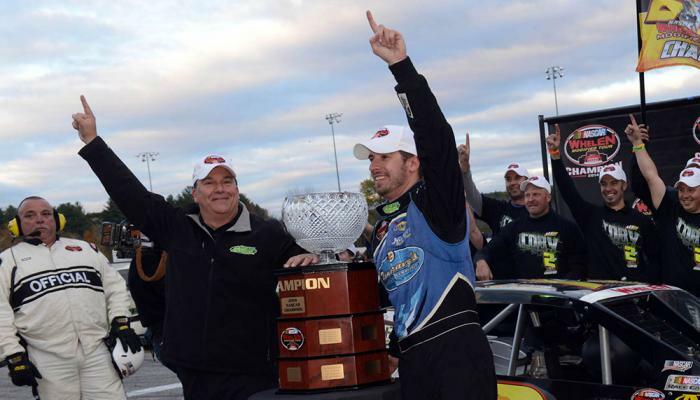 Few bring more passion than newly-minted NASCAR Whelen Modified Tour champion car owner Mike Smeriglio III. One of the best brand ambassadors in the Whelen Modified Tour garage, Mike Smeriglio III’s effervescent demeanor and willingness to help out in any way he can buoys his team as well as the entire tour contingent. It’s not uncommon for Smeriglio to loan a back-up car to a competing team that encountered issues and was in danger of not being able to participate in a race, or to give an opportunity for a younger driver to race a second team entry. An accountant and financial planner, Smeriglio’s entry point into NASCAR racing on the other side of the fence came in the late 1990s when he became the owner of Frank Wainwright’s SK Modified team at another famed Connecticut oval, Stafford Motor Speedway. When Wainwright retired, Smeriglio co-owned the No. 47 Stafford SK with various drivers until an opportunity came along to go tour racing. For the financial planner Mike Smeriglio III, it was an investment that provided immediate returns: the long-awaited championship. And Smeriglio’s valuation of the asset he invested in? Coby may have been the final piece to Smeriglio’s puzzle, but one piece already in place took great satisfaction in seeing the mission finally accomplished, the No. 2 team’s veteran crew chief Phil Moran. Smeriglio’s resolve has been tested through his journey to this first title though. He had the championship within reach in the 2011 finale, but a late-race accident ended the dream. For a person as passionate and as driven as Smeriglio, there will certainly be some time to reflect on this year’s accomplishments, but he’s also more than ready to turn the page.